Economy dives over the Donbas blockade. The government at a Cabinet meeting on Wednesday, 31 May officially worsened the country's 2017 GDP outlook from 3% to 1.8%, inflation from 8.1% to 11.2%. 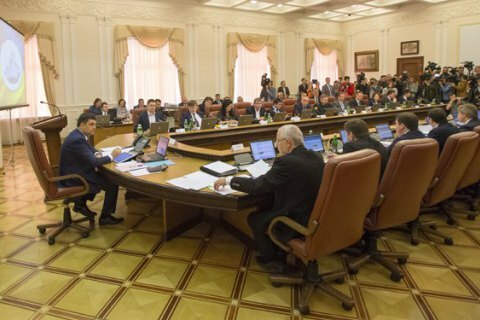 The Cabinet revised the forecast of nominal GDP figures from 2,584.9 bn to 2,845.8 hryvnya, and the forecast for growth from 3% to 1.8%. The government fears that the average annual inflation will be 12.9%, rather than 12.7%, as expected earlier, and in the annualized December to December figures – 11.2% instead of 8.1%. In addition, the Cabinet worsened the forecast of the negative trade balance from 2.7 bn dollars to 6.5 bn dollars. The forecast for exports of goods and services this year will be 50.7 bn dollars against previous 47.2 bn, imports at 57.2 bn against previous $ 49.9 bn dollars. The Cabinet also increased the forecast of the wage fund of hired workers and servicemen wages from 666.9 bn to 796.3 bn hryvnya. At the same time, the forecast average wage will be UAH 7,104 instead of UAH 5,988 (+ 21.4%). Also, the Cabinet revised the forecast for the number of people engaged in economic activities (15–70 years) from 16.7mn to 16.25mn, and the unemployment rate to hike from 8.7% to 9.3%. At the meeting, the government also approved the forecast for GDP growth in Ukraine in 2018–2020. The Ministry of Economy developed three scenarios for the development of the Ukrainian economy in 2018–2020. According to the moderate basic scenario the GDP will grow 3% in 2018, 3.6% in 2019, and 4% in in 2020. Earlier, the National Bank of Ukraine and the IMF have worsened the outlook of Ukrainian economy, citing the transport blockade of the uncontrolled territories and loss of control over the enterprises located there.